Exploring the wilderness of Africa doesn’t always have to be by foot or wheels. You can take your adventure to the water by embarking on some of the continent’s most exciting river cruises where you’ll find hippopotamuses wallowing in the stream and elephants splashing with their trunks. But before you hop on the boat, you’ll want to arm yourself with knowledge of some important things. After all, this is the wilds of Africa and not some happy hour cruise in your hometown. Here’s your guide to river cruising in Africa. Don’t assume that you can do a walk-in for every river cruise tour. River cruising is very popular among tourists and it’s common for them to sell out. The last thing you want to do is promise your entire family a fun day on the water, drive for hours to a national park that has the tour, only to be turned away once the staff tells you that they’re all full. To avoid looking like Chevy Chase at Wally World, just do your research, call ahead and book as soon as possible to secure a spot for you and your family. Cruises are also largely dependent on the season. During peak season, its even more crucial to make your reservation. What is this? Kindergarten again? Yes, the golden rule applies when you’re on a river cruise for your own safety. Plus it’s just common sense to not dangle your feet in the water or dip your hand in the river to check the temperature. Unless you want to sacrifice your fingers to Lilo the crocodile for happy snack time, keep your hands and feet inside the boat. Most river cruises will let you know up front that you’ll have to pay an additional fee if your tour is going to enter another country. 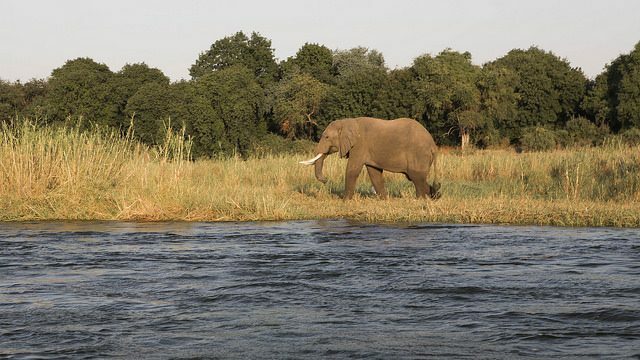 Border crossing on river cruises is common, especially at Chobe National Park and on the Zambezi River. Because you’ll temporarily enter another country, some paperwork and visa approval may be required before you go on the boat. If you’re one of those travelers that love to build up a collection of stamps on their passports, this is a good way to rack a few more up. You’d be surprised to mindlessly book a tour and not realize its reserved to be narrated in German or Mandarin only. Many tour guides will rotate their tours where a guide will speak different languages to accommodate travelers from across the globe. Most tours are in English (some guides might speak in broken English) but always double check to make sure its in your language. Otherwise, when the guide points at the water and yells out “Nilpferd!,” you’d want to know what it is, right? For the love of god, you want to be smart and not a sitting duck for all the hungry mosquitoes of the Zambezi River. Especially if you’re booking the sundowner cruise, the time when those blood-thirsty mosquitoes are out on their hunts. You’ll also want to pack or at least rub yourself with some suntan lotion, depending on how sunny it is. Keep in mind, some boats aren’t covered, so you’ll be exposed to the strong sun for an extended period of time. Or if the cruise is going one direction for awhile, hitting one side of your body (think of when the sun is beating down on your left side in your car on the highway). All of a sudden, rushing to sit at the side end of the boat wasn’t such a good idea, eh? But you’ll be fine if you came prepared. Motion sickness on river cruises aren’t as common since the water is relatively flat with very little current. But for those who are highly sensitive, it’s advised to pack some motion-sickness medication or an aspirin to combat your urge to hurl your lunch overboard. On that same note, it’s probably best to not have a big lunch beforehand either.